South Africa's powerhouse lock Victor Matfield has called for referee Christophe Berdos to be left to do his job by both sides in the second Test against the British & Irish Lions, insisting that he will be focused on aspects of the game that he can influence directly. New Zealand referee Bryce Lawrence frustrated the tourists' management with his policing of the scrum, where the Springboks dominated, with Lions prop Phil Vickery being penalised frequently during the opening period as he was given a torrid time by Springbok Tendai 'Beast' Mtawarira. The Lions stemmed the flow of penalties following the introduction of replacement prop Adam Jones, who will start on Saturday. "I think there's going to be a few questions about the referee but we should rather focus on the things that we can control and that's the most important thing," said Matfield. "Let him do his job, he's a great referee and that's why he got an important game like this. "I think as long as the penalties go with the dominant scrum then you can't really go wrong. That's what happened last week. First half we got a lot of penalties because we dominated the scrums and second half they got a few when they started dominating. "The most important facet is probably at breakdown, ruck time, how he interprets that. So we need to adapt to him as quickly as possible on the day and then just need to concentrate on our own game." Bulls skipper Matfield is excited about taking the Lions on at his home ground but is not putting too much importance on the vociferous nature of the crowd support in Pretoria. "There are quite a few of the Bulls guys in the team," said the lock, one of five Bulls players in the starting XV, with a further three on the bench. "So it would be great for us to play at Loftus. "The crowd is as crazy as you get and it will be very nice to play there. But again, there will be a lot of Lions support as well, just like last week. I think Pierre Spies said yesterday 'Loftus is not going to win the Test'. But yes, if we go out there and put pressure on the Lions, then hopefully altitude and everything can come into play." 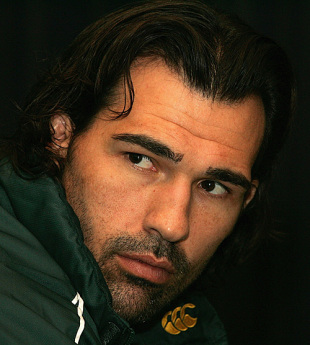 Matfield is not expecting the altitude to play too much of a part in the outcome, playing up the fact that the Springboks squad contains plenty of players from the coastal teams of the Sharks and Stormers. "To be honest, if we are playing Super 14 rugby and the whole squad is used to altitude, then it could be a big bonus. But with the Springboks, there's quite a few guys that are from the coast so I don't think it will have that big an influence." Matfield is also looking forward to seeing openside flanker Schalk Burger return to action after a calf injury, expecting the Stormers man to put added pressure on the Lions and allow the Springboks an easier defensive workload. "I think Schalk brings a lot of experience," he said. "He's a big, strong ball-carrier, who's everywhere on the park. He's probably not as renowned at fetching as Heinrich is. But he's been one of our star players for the last four to five years. "He's very strong over the ball, he'll be counter-rucking and he'll be in that ruck. They'll have to send two or three guys to keep him out of there and that will make defence easier for us as well with them having to put more numbers into that ruck. He's also playing his 50th Test so it's going to be a great day for him and hopefully we can make it even more special for him by winning the series."